Hope you all are having a great Sunday. I have gotten in the Christmas/December spirit already. So even though we haven't had any snow, I decided to do a snowy manicure. / Espero que todas esten pasando un bonito Domingo. Ahora si que me he emocionado con la Navidad y Diciembre. Con todo y que no ha nevado aun, decidi hacer un manicure con nieve. Click the picture for more photos of this mani! Oh Wow! Totally creative and new! I simply love this! You took one of my favorite themes (snowflake) to a (HNL) 'hole 'nother level with HellO Kitty Snowman! You are ta len ted! 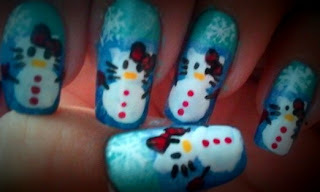 Aww, that's the cutest snow-kitties ever - great mani, Lydia! Haha, that's is so cute!!! I love it! A hello kitty snowgirl!? Thats hilariously cute! I've never seen that before. Girl, you have some major artistic talent!! It's lovely and neat work for the snowflakes. Wow! So cute!! I love the gradient in the background!! I'm not ready for snow yet!! looks so cute, just great!